Cairo- The United States promised during recent talks with Libyan officials to provide embattled Libyan leader Moamer Gaddafi with a safe haven if he agreed to step down, a Libyan official said in remarks published Wednesday. 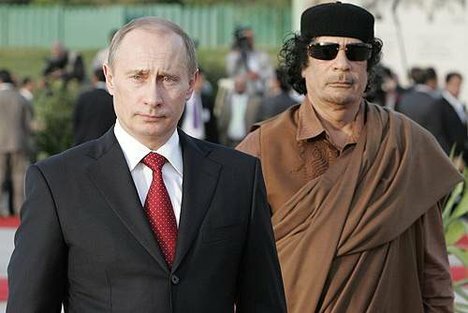 'The US delegation expressed clear readiness to go ahead and find a place or a country prepared to host Gaddafi, along with offering him guarantees that he will not be tracked down for prosecution,' the official was quoted as saying in the pan-Arab newspaper Asharq Al Awsat. The newspaper described him as being 'close' to the talks with the US. The official, who asked not to be identified, added that the US delegation had warned the Gaddafi regime against procrastination. According to the newspaper, the meeting was held Saturday in Tunisia and was attended by Bashir Saleh, the director of Gaddafi's office. Asharq Al Awsat also quoted sources in the Gaddafi regime and the opposition Transitional National Council as saying that Saleh asked for the meeting 10 days ago upon instructions from Gaddafi. On July 15, some 40 countries and international organizations, including the US, recognized the Transational National Council as the legitimate representative of the Libyan people. Gaddafi vowed late Tuesday to 'fight until the last drop of blood' as rebels claimed to have gained control of the strategic eastern oil town of Berga. 'Together with millions of Libyans, I will fight until the last drop of blood in defence of the Libyans' honour, oil and wealth,' Gaddafi said in an audio address broadcast on state television. 'We will not surrender under (the pressure) of the NATO strikes ... This war is imposed on us,' he said. On Tuesday, NATO said it had carried out a total of 15,669 sorties in Libya, since its UN-sanctioned operations started on March 31. Libyan rebels have been struggling since February to oust Gaddafi, who has been in power for 42 years.